This lesson will help you better understand how points, scores, and percentages work. Points represent how much an assignment is worth in your GradeBook. A percentage may also be used (e.g., entered in the gradebook) to communicate a student's points and score. Examples are provided below. Clyde receives a SCORE of 47 out of 50 which is the same as receiving 94 out of 100 POINTS or a 94 PERCENT. Clyde receives a SCORE of 80 out of 100 which is the same as receiving 16 out of 20 POINTS or a 80 PERCENT. 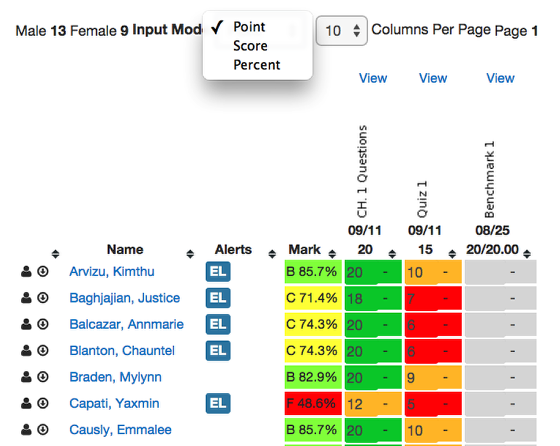 Most spreadsheets are set to enter grades using Points, by default. If you wish to enter a Score or Percent value instead of a Point value you will need to switch your input mode in your spreadsheet. You can change your default Input Mode in the Preferences screen, in the Setup tab.